Suggested reading review are "Lincoln's Gettysburg Address/United States presidental oath of office"
Quite common are certain negatory comments exhanged when one or groups of humans are engaged in conversation. Some are saved without ever having any useful function. As for myself, Elbert Jackson, how many such permanent memories I may have contributed for those with whom I became acquainted could not be catalogued. It is hoped in my own practice in exercising that skill of "talking without thinking" produces words that may be stored by others; but within shadowy, dustfilled, and clouded memory recesses by those who may have encountered me during this lifetime. It is asked that you might somehow forgive and forget some of what I may have said to you. That I will do for you in time. One inlaw residing in the far southern United States spotted my family, me, and my automobile pulling into his driveway. As my wife, I, and three daughters exited and walked towards the man who was to be our host (His name is Merc)noticed my rear license plate that was showing Illinois, Land Of Lincoln. "Abraham Lincoln was a tryant!" exclaimed Merc loudly. Quick in responding verbally, I answered Merc with:"I live and teach school in Illinois, but I have never had an occasion to meet Mr. Lincoln personally. To my understanding, he deceased over one hundred years past. I was raised here in Georgia near you and was never a participant in The American Civil War; so far as I know. "But let me also tell you Merc. Mr. Lincoln took an oath of office after his election to the presidency. If he'd failed to take action following that attack on Fort Sumter, he would have been impeached." "And let me tell you something else! I was required to place those plates on my car. Those cost me $75.00. If those plates were not on my automobile, I would have been stopped and issued a traffic ticket." "What is not true, a downtight lie is a statement I made to Merc:"I have never had an occasion to meet Mr. Abraham Lincoln. Yes, I have met Lincoln; not just once but thrice." Why those encounters were not shared with my sisters and inlaws was for avoiding gossip after we had exited their homes in Georgia. "My brother, Elbert, has for some reason, never been right. Everybody knows that he's insane." Much later in years, I, Elbert Jackson, reached age seventy-two_ having retired from teaching nearly twenty years earlier. 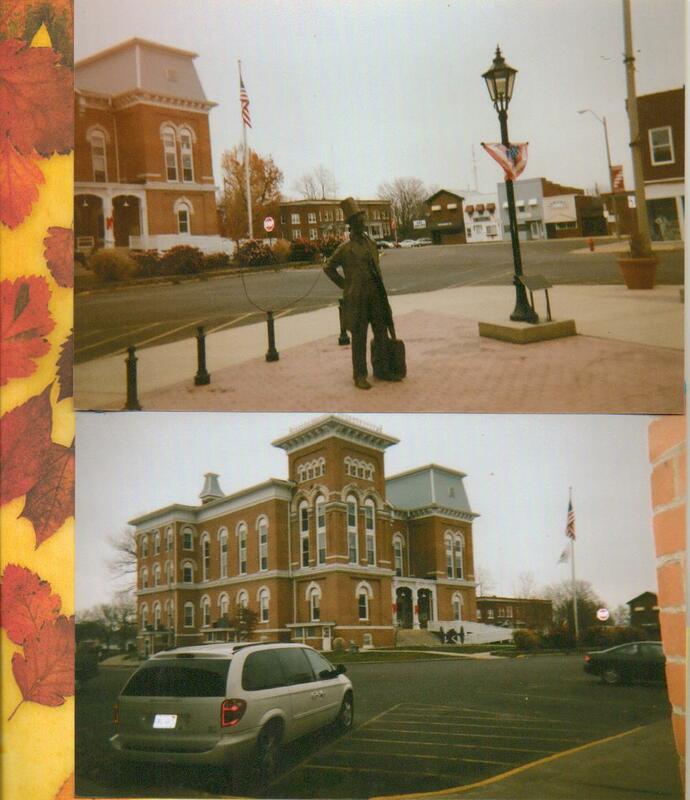 It was on a day in late autumn in Hillsboro, Illinois, my residence. Contemplating a flight to Florida where I would spend most of winter with a daughter and her husband, a blustery northwest wind as in "Winnie-the-Poo" and its refreshing air, I felt an itch to engage in photography. So I headed downtown with my camera; beginning to take pictures of The Montgomery County Courthouse and adjacent areas." That day during November, 2011 was a Sunday. Few were working, and only one pedestrian was seen strolling down an opposite street-then quickly disappearing. After snapping an image of some leaves that had accumulated in a corner of a cement pad, I was searching for another good shot when I heard a man clear his throat. And suddenly, I made an abrupt "about face." There stood Abraham Lincoln. "Elbert Jackson! I need to talk to you. You've sat around for years and haven't written a thing. I directed you to tell the people what I said to the band members there at Epworth By The Sea on St. Simon's Island, Georgia back during 1958. What did I say?" "Mr. Lincoln," I answered. "I recall the content of the speech you made to us. And I remember all the other future and past presidents who visited that day. But if I tell such a thing, people will think that I'm insane. I can't write such a story. "Yes, you can, Elbert! You have a responsibility to write it. I told you to do it! What did I tell you to write, Elbert?" "You told us that The United States would be at war with certain nations located in The Middle East and we would win. That the Chinese would be our friends and supporters and that they would help us. You said the war would be against terrorists and that it would be long and costly but that we would continue to be wealthy and that those nations that tried to fight us would be poor. You also met Jimmy and Rosamond Carter there. You told Jimmy that he would someday be President Of The United States and that he would be a good one. You turned the pages of Rosamond Carter's music pages for her as she played alto-saxophone." Said Mr. Lincoln: "Those are the most important points, Elbert. You need to go ahead and get with it now.I showed up there on St. Simon's Island for you. I also visited the school you taught there in Raymond, Illinois and entered your classroom and all of the others. I did that for you. I know you can do it, and it's important for your countrymen that you write it. Some will think that you're insane. Some said that about me. " "Mr. Lincoln," I inquired. "I have a photo of you and General McClellan. You were seated face to face, and you were exchanging words. I've often asked what you were saying to the General. Would you be willing to share that with me?" "Much of our conversation was just small talk, but I did communicate to the General some important information. He had expressed a desire to run against me for the presidency. I told him that I did not care to be his opponent but that I was relieving him of his command to make it easier for him to decide if he'd resign his commission and run against me. And another thing. I brought it to his attention that The Pinkerton Detective Agency had information that there was a plot to assassinate me. They knew that the people threatening my family and me were in that General's military unit. Pinkerton knew who the people were. I had also received threatening letters from soldiers in General McClellan's military unit. (I'm fulfilling Mr. Abraham Lincoln's request today, Friday, May 25, 2012. )Capable of better work, here's the best I am able to accomplish today.